In the eight years since the original publication of "Molecular Biology Labfax", there has been a vast proliferation of molecular biology techniques. 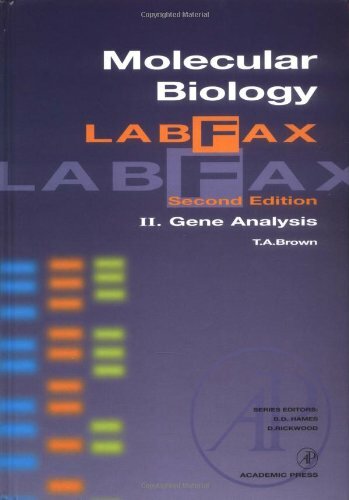 The second edition has been divided into two parts: Recombinant DNA, and Gene Analysis. Together, they comprise a comprehensive collection of the most up-to-date methods available in molecular biology. This second volume of the two-part second edition provides key information on nucleic acid blotting and hybridization, DNA sequencing, PCR, labelingnucleic acids, electrophoresis, centrifugation, chemicals and reagents, and safety. "Molecular Biology Labfax" will be essential for scientists of all disciplines within the life sciences who use molecular biological techniques. Its key features are: provides most up-to-date information on techniques, sources, and equipment for anyone using molecular biological techniques; offers clearly presented information; and, is divided into two parts which together comprise a complete collection of molecular biological methods.